The ultimate in precast concrete fencing. Permacast’s precast concrete walls are available in any height in a variety of textures. Both options are a great solution for enclosing communities or commercial sites. Our PermaWalls and Fences are designed to slide into each other, allowing for total customization based on your site’s needs. Since our walls can be built to any scale, it’s easy to work within municipal height restrictions or to meet security requirements. No matter how high you build them, Permacast walls provide a solid sound barrier as well as a sense of safety, and they look good doing it. 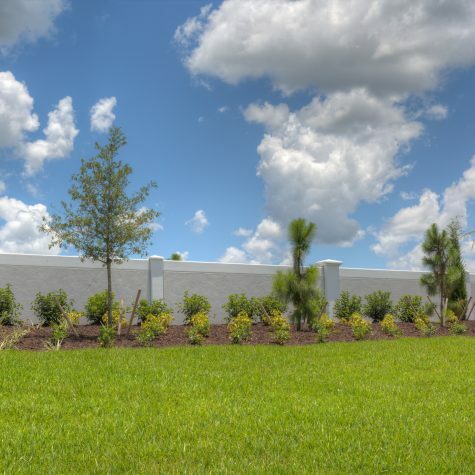 A great way to preserve landscaping, our walls make a handsome addition to your community. You’ll find Permacast precast concrete walls enclosing churches, schools, housing developments and mobile home parks. They protect water treatment plants, power plants and metal recycling facilities. They’re problem-solvers and defenders that truly go the distance. Over time, concrete gets harder, which means your investment only gets stronger the longer it’s there. PermaWall 2.0. is an extremely strong, efficient and aesthetically-pleasing choice, with panels that are 20′ apart. This is the wall for projects where access is not an issue and where wind load (the 2.0 exceeds any in the country) isn’t either. PermaWall 2.0 is available in a sophisticated sand texture, an appealing addition to your site. Our specs and drawings offer detailed insight into all of our products. Just click ‘Learn More’ to request them today, or visit our Download Center. Wondering What the Finished Project Will Look Like? Take a look at our product gallery and view some of our amazing projects.